Wall cloud forming on the storm north of Byers, CO.
Wall cloud tightening up as it approaches. Rain curtains being wrapped around the south side. Supercell with bolt of lightning over wind farm northeast of Strasburg, CO.
Another shot of the supercell as it takes on a terrific mothership appearance. 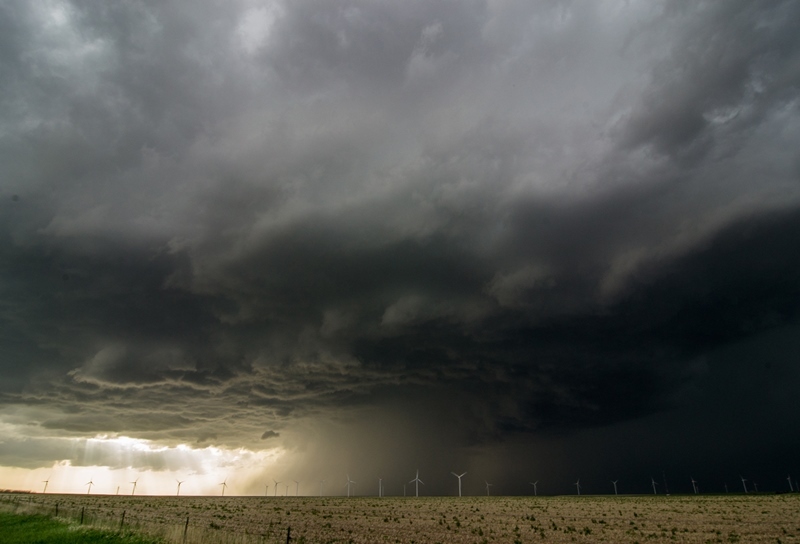 Storm over windmill to the north of Limon, CO.
Beautiful mothership over the open landscape of eastern Colorado. Great area to chase! 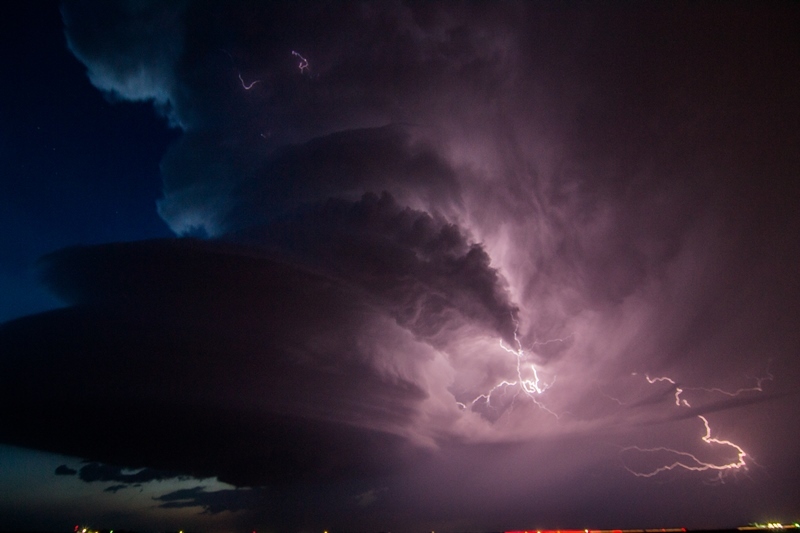 Great lighting for a photo opportunity near Flagler, CO. Supercell has terrific spiraled structure at this time. 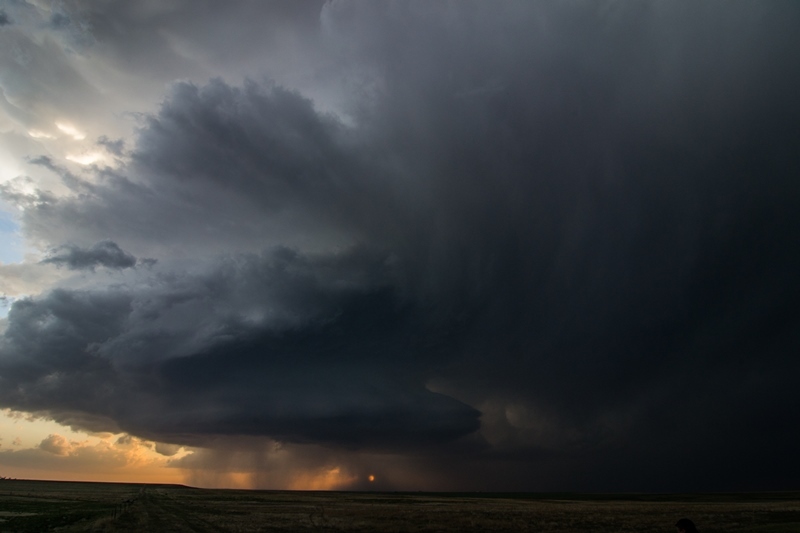 Awesome storm structure near Siebert, CO as the sun was starting to set to the west and allow for great back light. Mammatus on the northeast side of the supercell near Siebert, CO.
Another shot of the supercell with the light of the setting sun shining through the rain curtains. 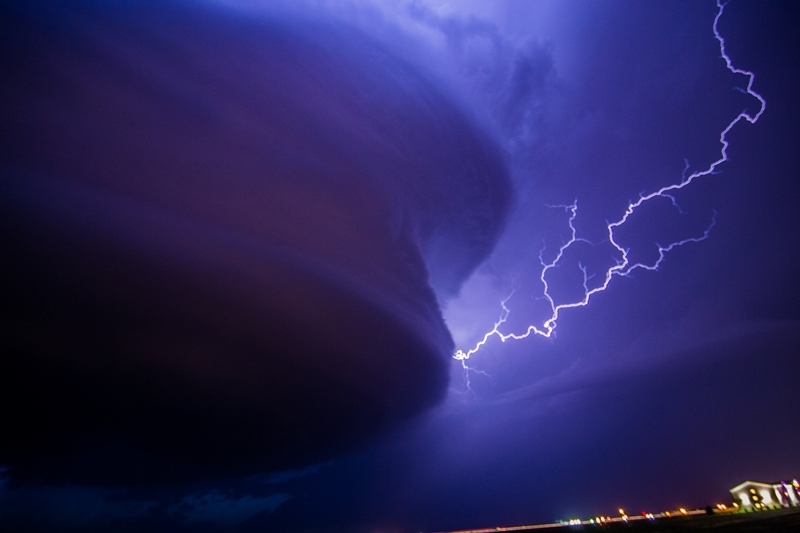 Could take photo after photo of this amazing storm. The core opening up around the backside of the storm right at sunset. One of my favorite shots ever taken. Might be framing this one I think! 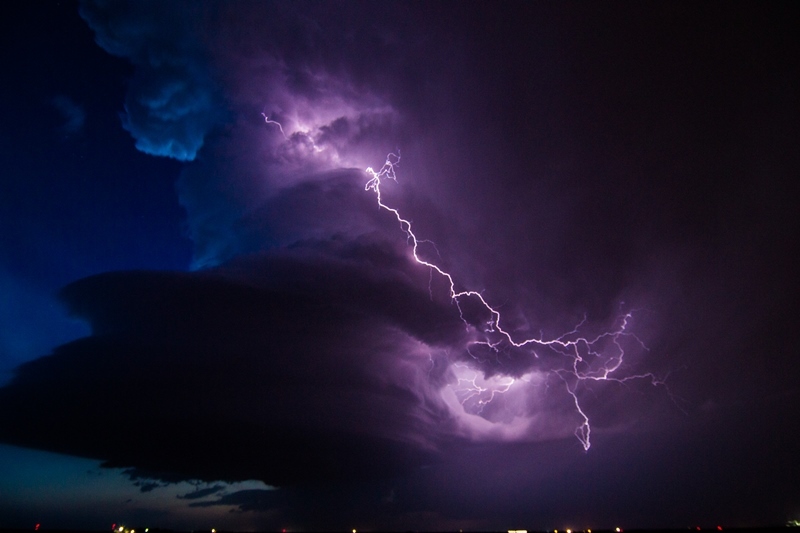 Another great shot of the storm and lightning near Burlington, CO. Was on a 6 second shutter speed. Incredible storm moving into Burlington, CO.
An awesome chase day to start the tour! We left OKC early with the expectation of heading all the way up to Scott's Bluff, NE to play the frontal boundary on the Nebraska Panhandle. We stopped for lunch in Hays, KS and decided to continue to head west before deciding on our target as the HRRR model was now showing two distinct target areas: Nebraska as advertised, but now it also developed storms near Denver riding right along I-70 all the way into Kansas. 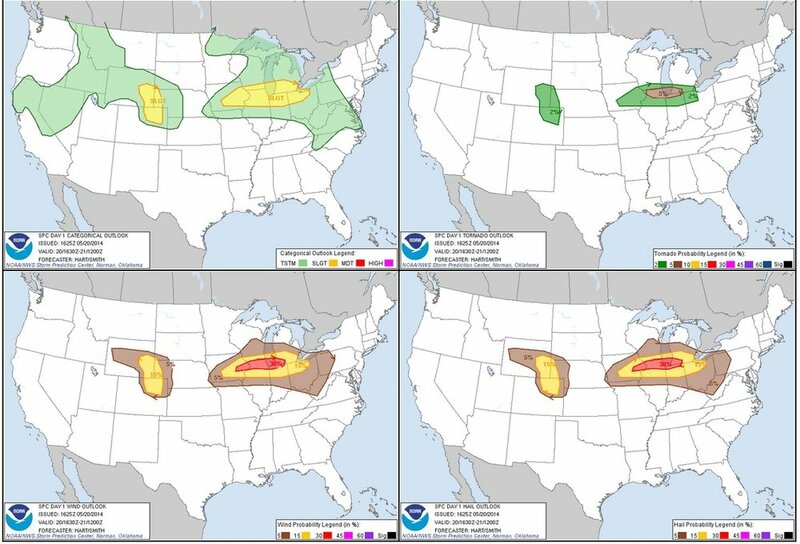 We decided to continue to Burlington, CO before deciding, and once there chose the southern target as the models were now killing the activity up in Nebraska by 02-03Z but kept the Denver storms going all night. That, along with the fact that a Denver intercept was far easier, made the choice simple. By the time we reached Limon for a quick pit stop, there was already a severe warned storm over Denver heading east-southeast right towards us. We set up in Byers as the storm approached from Bennett. As it got closer, it organized a broad, blocky wall cloud for a few moments, but it soon dissipated. Cold inflow was the rule of the day as it seemed to be streaming in from where we were at every stop, yet somehow it never appeared to choke off the storm. 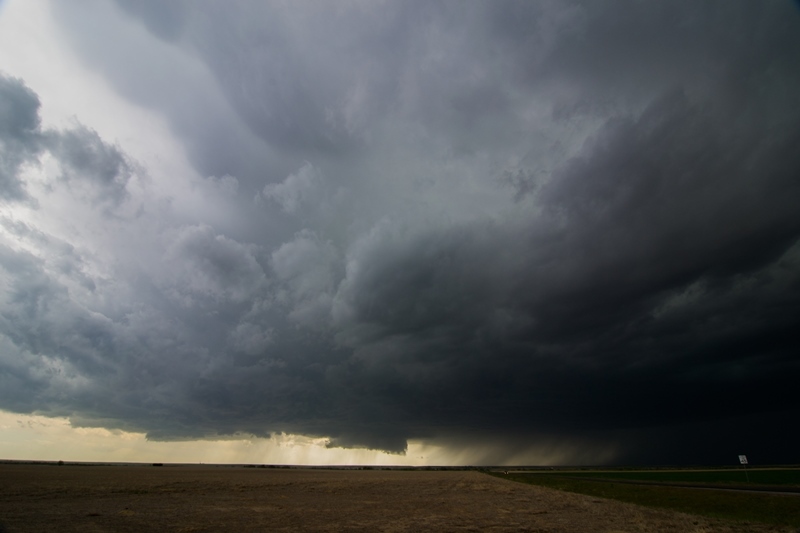 After the first wall cloud dissipated a second briefly formed, but as the storm neared our position and had large hail in it, we repositioned to Deer Trail for the second stop. Once there, we saw that the storm had become a huge HP hailer with a very broad base and a “nose down” wall cloud / tail cloud look. Soon the hail core encroached on us again and we drifted down to Agate. With the storm moving southeast now, we then had to bolt all the way to Limon to try and get north towards Last Chance and beat it to an east road. As we headed north out of Limon and into the huge wind farm in that area we just had to stop and take some shots of the huge beast with the wind farm in the foreground. We stayed there for about 10 minutes, at which point our north road was cut off by a hail core sporting baseball sized stones, so we headed towards the interstate, but then decided to head east on County Road 3. We stayed just out ahead of the storm until finding great spot for a photo opportunity and stopped and observed again. With the storm to our northwest, there were definite signs of rotation developing and, then behind us to the southeast there was rapid motion and a “cinnamon swirl” vortex above us, spinning hard enough that we thought we might get a landspout. That eventually dissipated and we had to quickly run east and south as rain and hail began to fall in our location and we were worried about getting swamped on the dirt roads. We made one more stop north of Arriba to shoot the fantastically structured liberty bell updraft, then stopped at a rest area along the highway for a break, but you could see the “stack of plates” look just above us and the clouds curving into the storm above us, so we headed east again to stay in front of the storm. We continued east to Vona and as the sun set were treated to the spectacular structure of the storm backlit by the orange sunset! 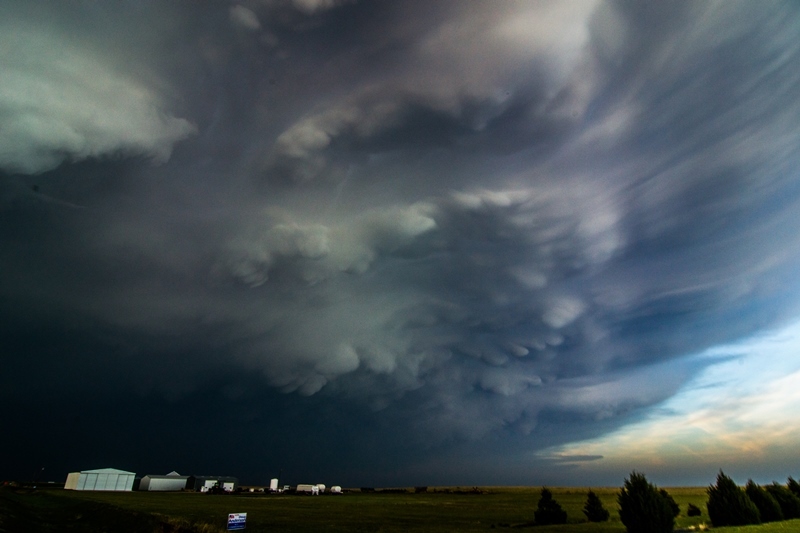 The storm also had a nice array of mammatus clouds hanging off the front part of the anvil. At that point it seemed like the storm was finally dying, but as the sun set, perhaps the low level jet kicked in because the storm re-intensified yet again into a tall soda can look. We made another stop in Bethune, then another in Burlington, and the structure at dusk just kept getting more and more amazing! By now the storm was highly electrified, but interestingly it was almost all cloud to cloud, with very few ground strokes. It was sort of eerie as the spinning updraft came almost right over us, then off to our southeast a huge bob of dirt flew up from the rear-flank downdraft, right around the time that they tornado warned the storm! It was obvious that the storm was way too high based to tornado though and we waited south of Burlington for the storm to zoom by, and then got back on the highway, retracing our steps 150 miles back to the hotel in Denver. A day that greatly exceeded expectations! The HRRR model was dead on, as the Nebraska storms blew up, one went tornado warned, and then in about 2 hours they were gone, while the Denver storm raged right down I-70 into Kansas well into the evening as advertised. 962.6 miles for Day 1!